Recently I had to travel to Scottsdale for business, and stayed in this very nice eclectic hotel. One of the first things I noticed once I checked into my room was when I went to wash my hands; I opened a packet with a little purple ball of soap. It wasn’t your typical small white nondescript miniature square bar of soap. This one was perfectly round, and had this wonderful lavender scent. 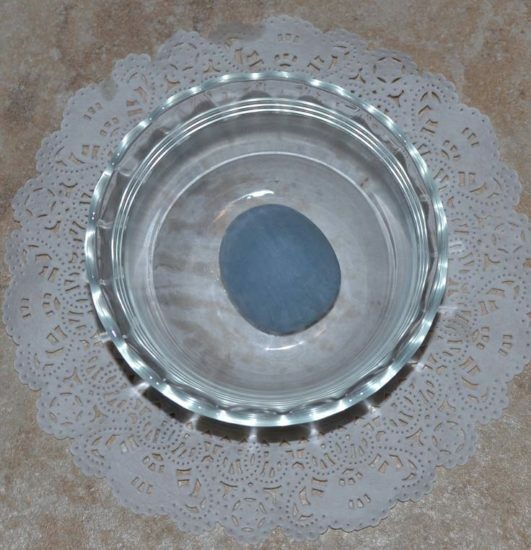 After washing up, I placed the ball into the round soap dish they provided, and continued on my merry way. Two days later when I was packing to head home, I noticed I couldn’t leave the little purple ball of soap behind. It still looked brand new, and I just felt it would be a waste to so easily discard it. So I dried it off with a clean washrag, and packed it in my suitcase. Once I got home I found a small glass dish and placed it next to my kitchen sink…and then began to notice…. Normally when I wash my hands at the kitchen sink, which I must do at least 5 or 10 times day, I quickly squirt some soap on them, rub them together, rinse, and dry. However, now with this little purple ball my routine was instantly changed. I was no longer rushing, and instead noticing how the soap felt in my hand as I rubbed it between my palms, and then I noticed the feeling of the soap on my fingers and the sensation of the water as I rinsed. And then I took the time to pause and smell my hands, not something I ever do, but I wanted to gently breathe in that wonderful lavender scent time and time again. So I thought I would notice the effect this little purple ball of lavender soap was having on me for a day or two, but it has now been over 2 months (!) and still I’m enjoying something as simple as washing my hands. I now not only notice my fingers, but also have become aware of being grateful for having fingers, for being able to feel, and for being able to enjoy the soap’s wonderful scent. This little purple ball has taught me to slow down, and be grateful, and appreciate so many things I had begun to take for granted in a rush to move on to whatever was next.